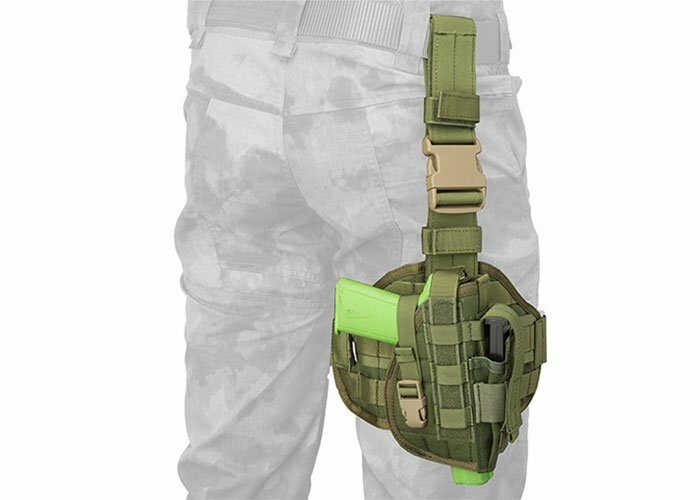 The Flyye Industries Tactical Drop Leg MOLLE Pistol Holster is an exceptional piece of gear suitable to carry a wide variety of airsoft pistols. Secure your airsoft gun with the quick release buckle that is simple to use. In addition, there is a a pistol magazine pouch attached to the holster with a hook and loop strap to keep it in place. The system mounts onto your belt with another large quick release buckle that you can utilize when you want to remove the holster from your set up. There are five rows of MOLLE that can be used if you desire to remove the pistol holster. Adjust the waist and leg strap to your fitting to get you out onto the field ready to take on the challenges ahead.